You may have heard your accountant talk about "doing payroll" or "payroll taxes." Payroll is an overall term used for several types of operations related to paying employees and paying payroll-related taxes due to federal and state agencies. The calculation and distribution of paychecks (physical or electronic) to employees each payday, as in "I finished doing payroll yesterday." It can also mean the record of total earnings of all employees for a company in a fiscal year. Employees are hired to do a specific job at a specific rate of pay. Some employees are paid a salary which is the same amount every payday. Other employees are paid by the hour, so their pay for the pay period changes based on the number of hours worked. Overtime may be included in the pay of an employee who works more than a specific number of hours a week. This amount is called the employee's gross pay. All calculations in the payroll process are based on the gross pay amount for that pay period. Then, on a regular date determined by the company, these employees are paid. (Some employees may be paid at different times, depending upon their status. For example, salaried employees may be paid twice a month, while hourly employees may be paid every week. 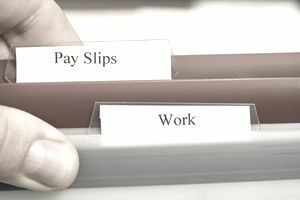 After the employee's pay is calculated, the employer must withhold FICA taxes (Social Security and Medicare), and Federal and State income taxes from each paycheck. The employer may also deduct other amounts from the paycheck. These might include a retirement plan and health plan contributions, union dues, and charitable contributions. But "doing payroll" isn't complete yet. After the employer distributes paychecks (or uses direct deposit), other calculations must be done. The employer must calculate and set aside amounts deducted from the employee's pay, to be paid later. The employer must also set aside an amount for the employer's contribution to FICA taxes and for unemployment taxes. "Doing Payroll" also includes recordkeeping. A separate record must be kept for each employee, showing amounts paid for each pay period, for end-of-year reports. Records must also be kept of employee authorizations and any changes in pay. The overall record of all the calculations for all employees is called a payroll register. This record shows all amounts of salary and wages for each pay period and totals for the year. If you have a payroll program as part of your business accounting system, the payroll register is part of that system. The totals are fed into the overall financial statements for your business. Payroll calculations for an individual employee over time are called an earnings record. In addition to the earnings record, all documents related to that employee's pay, deductions, and withholdings must be kept during the person's employment. If this all sounds complicated, it is. That's why many employers outsource payroll, sending it to a payroll processing service or to a bookkeeper or accountant. Payroll taxes are those taxes required to be paid to federal and state taxing authorities as a result of paying employees (such as FICA taxes and unemployment taxes). The IRS strictly defines payroll taxes as FICA taxes (Social Security and Medicare), but the term is often used in the general sense. Payroll processing describes the preparation of paychecks (including withholding and deductions), distribution of paychecks, and payment and porting of payroll taxes. Options for payroll processing include doing it yourself with accounting software, hiring a bookkeeper, or engaging a payroll service.